President Donald Trump never thinks things through. He claimed ownership of the shutdown in front of news cameras with no plan to end it. He capitulated after 35 days, signed another continuing resolution and staged an announcement in the Rose Garden telling his supports how "proud" he was of his achievement. He still didn't have any plan how to avoid a final defeat on funding for a wall. A week from the Feb. 15 deadline for negotiators to reach a government and continue to fund the government, Trump finally faces defeat, complete and undisguisable defeat. "Senate Appropriations Chairman Richard Shelby, R-Ala., told reporters after meeting with Trump that he believes the president will support a deal that bipartisan congressional negotiators produce — as long as it meets his parameters. Lawmakers must reach a deal by Feb. 15 to avert another partial government shutdown. "Shelby declined to detail Trump's requirements, and he did not say whether the president had agreed to accept less than the $5.7 billion he's been demanding to build a steel wall along the U.S.-Mexico border." Shelby is no fool and understands that the Democratic negotiators are not going to agree to a wall, no matter what Trump’s parameters might be. It is not altogether clear that Trump even knows what the deal might look like. He nevertheless appears to have given Shelby his proxy to close a deal. There are at least three signs that the White House understands it won't get what Trump wants. First, Trump on Thursday described the need for "border security" without reiterating his demand for a wall. ("We need border security. We have to have it. It's not an option. Let's see what happens.") Sure, he brought it up at the State of the Union, but that's hundreds of news cycles ago. Second, acting White House chief of staff Mick Mulvaney, knowing that an emergency declaration lacks legal legitimacy and Republican support, is mumbling about some other solution. ("Mulvaney said the steps would come through some type of executive action. He didn't specify whether that would require declaring a national emergency, which Trump has threatened for weeks, or if there was another mechanism that might prove less controversial." Or maybe the mechanism is simply nonexistent.) It's noteworthy that Mulvaney doesn't even raise the prospect of another shutdown. How Trump will spin this — or if he will choose to distract the country with some outrageous stunt — is anyone’s guess. The lesson for both Democrats and Republicans is clear and goes well beyond this issue: There will be no partisan legislation through the end of Trump's current term. A week from now, Pelosi most likely will be able to point to a Democratic victory on the single most important issue for Trump and his base. If he isn't getting the wall, he's not getting anything else on his wish list that requires legislative approval. How will members of Trump’s base react to defeat on the wall? Trump might find a way to snow them, allowing them to rationalize the defeat. However, there will be some hard-liners who give it away — acknowledging that Trump folded. Whether this realization will simply depress the GOP base or whether it will spark some mini-revolt remains to be seen. 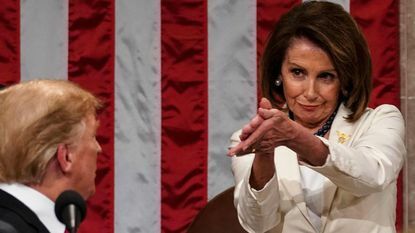 In any event, Pelosi will not tire of winning. Jennifer Rubin writes reported opinion for The Washington Post, where this first appeared.